December « 2013 « Yeah, right! December 31st isn’t just about raising a glass of cheer to the New Year, nor does it have only to do with wolfing down twelve grapes at midnight, though both stand out in participation and zeal. In many parts of Spain, and in Madrid in particular, it means locking on your running shoes and bounding ten kilometers down the Castellana of Madrid all the way to Vallecas. This is known as the Carrera de San Silvestre, and it also is the biggest street race of Brazil, I take it. This fun run is just the kind of social gathering the Spanish love. It’s also packed with feel-good benefits, like getting in a little exercise before the excesses of the night that looms, or burning off a few hundred of those calories that have colonized in your body over the past few days. The sad news is that we are only halfway through the Twelve Days of Christmas, but I guess every little bit helps. Saint Sylvester I was one of the first popes and it was under his papacy that the original Saint Peter’s Basilica was built. Not much is known about him, and what is available is highly debated, so we’ll center on his death, which was not a tortuous martyrdom as was so common back then, but seemingly natural causes. The day was December 31st, he missed out on that year’s festivities, but did leave the legacy for long-distance runners centuries down the road, if you’ll excuse the pun. Certainly this was not part the design, but history has a funny way of working that way. I have yet to take part in the old San Silvestre, though if only to free myself from the incessant Whatsapp New Year greetings piling up on my cell, it wouldn’t have been a bad idea. I will make it one of my objectives for next year. There you have it, my first proposition. A good choice. I have eleven and half free months before I have to get working on it. There it is. One fine display of clothes clipped neatly on a sagging line of nylon rope and dangling in the foreground of the elevator in one of our patios interiores. It could be located in any one of a thousand buildings. I can’t speak for all parts of the States, but in general, in my part of Connecticut, hanging out the wash is not only unseen, it’s quite unsightly. Some people I know get uptight because they seem to think it represents the kind of backwardness only people who shoot alligators in the head will do to their laundry. But in Spain, even to this day, in modern and cosmopolitan Madrid, a clothes dryer is rarer than a coming upon a forest in La Mancha. It’s almost considered extravegant. There is a certain logic behind this all. 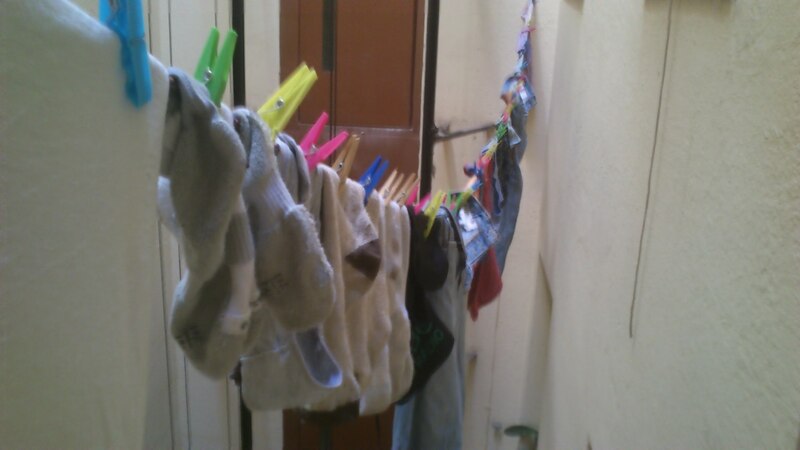 Madrid’s climate is generally so arid that it doesn’t take long for the clothes to become stiff dry. One night will do, and in the blistering summer heat, even less. Periods of dampness naturally hamper the process, which is when you have to haul things in and use an indoor rectractable clothesline, because no one wants one hanging around when there is no precipitation. But other than that, the traditional way is both a money and energy saver. In Connecticut in the summer, if you are hit by a prolonged stretch of humid weather, your jeans might never quite free themselves of moisture. I take pride in this image as it is proof that I have come close to mastering one of the great Spanish chores: hanging out the wash. And for those of you who are looking for further and irrefutable proof, I will gladly introduce you to the neighbor from upstairs, an amiable elderly woman whom I barely know, but who just recently honored me with her approval of how I set my boxers out for drying. Coming from a Spanish señora, that says a lot. They don’t mete out those compliments for free. It’s another milestone. This morale booster would probably never have been brought to my attention had it not been for the fact that a handkerchief had slipped from her upstairs line and drifted onto mine, an unlikely occurrence, but one that could occur all the same. Clothes drop, but generally not as often as the clothes pins, which have a funny habit of popping off from their grip on the article of clothing they should be securing and plummenting to the bottom of the interior patio. I always wait in silence for the plasticky bounce and in the meantime wonder about the horror of being the object in flight instead. I bet a lot of people do. It seems to take forever. What I didn’t know at the time was that how I positioned my clothes along a stretch of rope was apparently under scrutiny by the female residents of the building, but then again, by this point in my life, it shouldn’t really come as a surprise. Spanish señoras are sharp observers of how their neighbors conduct their business, and more so of anything that is visible, such as the wash. Up until that point my only concern was the family below on the days that I wash my sheets and they dangle down like huge banners obstructing the view. Of the inside patio, of course. 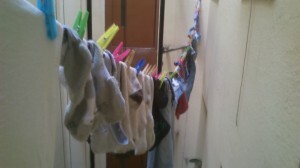 You aren’t allowed to hangout your wash on your balcony, at least in most parts of Madrid. That is certainly unsightly and unseen. Thanks to the bit of positive reinforcement, I now devote a few extra seconds to perfecting my technique.